Pool Shark 2 really does put the "cool into pool", with its fantastic set of characters who will challenge you to hustle in their own unique environments. Characters have been developed in depth and have their own motion capture, and dialogue. Oppone.. In the twisted Room Zoom manor, use everything under the roof to hone your driving skills and take the checkered flag. We put you in the driver's seat of toy cars to race at break-neck speeds through every room in the house, including a spooky lab an..
World Championship Pool 2004 is the most authentic pool simulation video game coming to market. With licenses for the world’s highest-ranked competitors such as Earl “The Pearl” Strickland and Germany’s Oliver Ortmann, World C..
World Snooker Championship 2005 offers gamers the ultimate simulation of the beloved game. As you might expect, this game has all the big names, but this time there's simply a lot more than any snooker game gone before. 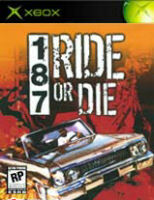 More features, options, game m..
187: Ride or Die features the voices and likenesses of rising young actors including Larenz Tate (Menace II Society, Ray), Noel Gugliemi (Training Day, The Fast and the Furious), and Guerilla Black. 1..